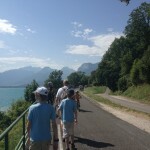 Just a couple of weeks ago we spent a fleeting few days down in France – pure idyllic, restful, calm, an escape from the busy life in the UK, on the edge of Lake Annecy, the perfect setting for promenading, scooters, and just strolling, seeing how stylishly the French dress and so on. We opted to drive down, and basically take the essentials to keep the kids occupied, rather than fly or take the Eurostar. So the Eurotunnel it was. The car is very well-equipped and incredibly spacious, so we were well and truly spoilt. The seats are roomy with lots of leg room, head rests, air conditioning and so on. The key criteria for me when travelling with kids, and this goes back, (clears throat nervously) to my Girl Guide days, is to always be prepared. So, with red cross parcel at the ready, boot fully loaded with items for “just in case” we headed off to Folkestone. The maps with route planned out were within arms reach, passports, booking references all in a clear plastic wallet. Yes, we must have looked well and truly organised (ha!ha!) Well, that is how we try to project ourselves! Now I have to admit we did pack rather alot: the scooters, and with three in the brood we had to take the three, can’t have any unnecessary arguments, can we? We also took the tennis rackets and the essential green and yellow balls, water bottles, tennis bags. Plus the basket ball, football, cagoules, wellies and of course, our overnight bags. The appartment hotel we were staying in, luckily was providing the bedding, and towels, so we did not take those. We had also booked into one of those budget hotels en route, so we could get a couple of hours into France, ie just south of Reims before bedding down for the night, to then continue fresh and complete the five hours or so the next day. We have from experience, found it is just not worth doing the trip in one day, driving through the night. I for one am not in the best of moods after an all-nighter and if I’m honest I need my sleep. Hubbie would never agree that he is the same, but anyway, we have found a compromise and we stick to it. We also purchased magazines, quiz books, joke books to help keep the kids amused, but of course, it is difficult to read and such in the car, I know it doesn’t agree with me. When they were alot younger we used to play games like “I spy!” and the number plate game, and we even had “The Travel Game” which is a card game, with either road signs on, or a cat, church, telephone box, pylon, ambulance, basically the kinds of things you would see on a journey, and the idea is you spot the item on the card, call out and the first to use up all their cards wins. Of course, you can make this more complex, and make it the best of 3, 5 or whatever, but could I find this game before we left? Was it in the glove compartment or side pocket, where I used to keep it in the old car? Was it lurking in a bag in the garage? Well then, where was it? OK how about a DVD? Yes, great OK so which one? Come on, you all have to agree, so you work it out between the three of you..
Well, only until the DVD finished. Then the bickering started of new and the twitching. We needed a pit stop, so all pulled over at the next services to re-group, stretch our legs to then continue the next leg of the journey. And what magically appeared in the car about a week ago? The Travel Game Hoorah! So at least we have the game at the ready for next time. We plan to limit the “screen time” as we call it and stick to the traditional methods of passing the time in the car. So tell us, what do you do to keep the kids amused on a journey? « Lunchbox World part of Picnic Hamper Giveaway on the Good Web Guide!